I am super excited to share today’s drink of the week as it has easily become one of my new summer favorites! The drink’s sweet pineapple aroma and a (tequila) sunrise style appearance makes for an inviting cocktial. It starts sweet, moves to a bit of spiced rum taste, then to coconut on the finish. Near the end of the drink you start getting a sweeter raspberry finish which rounds everything out making for almost 2 drinks in one. This one may be a little too sweet for some of you so it doesn’t quite make it perfect, but it’s damn close. Shake all except raspberry liqueur with ice. Strain into an iced highball glass (or pint). Pour raspberry liqueur on top (should slowly sink to bottom). Garnish with an orange slice and cherry. So yes I am VERY late for the new drink of the week, but I’ve got something very interesting as long as it’s not too late. 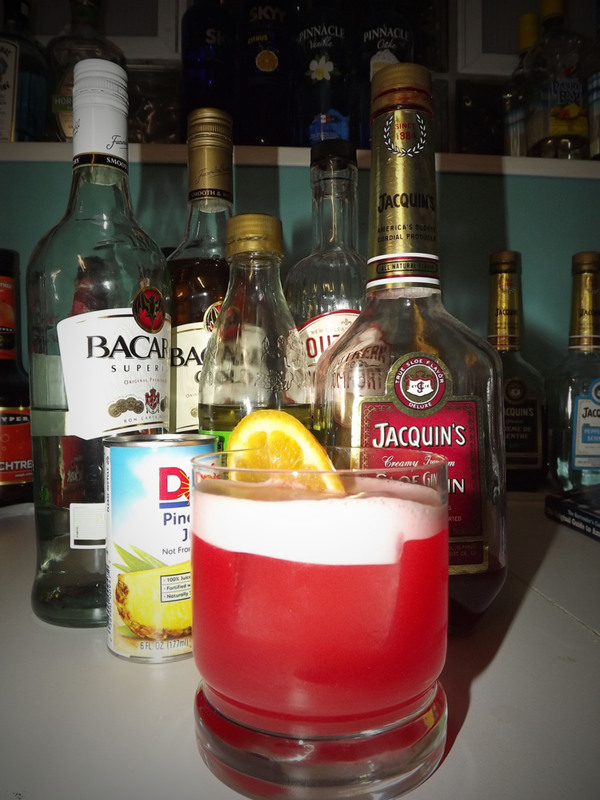 The Royal Hawiian matches some interesting flavors together for a decent tropical summer drink. It has a sweet almond aroma with a classy foam top and yellow/cream color. It starts out with a tropical sweet taste, hits the mid palette with a strange almond and gin combo, and finishes on a slight sour note and the mild alcohol burn of gin. 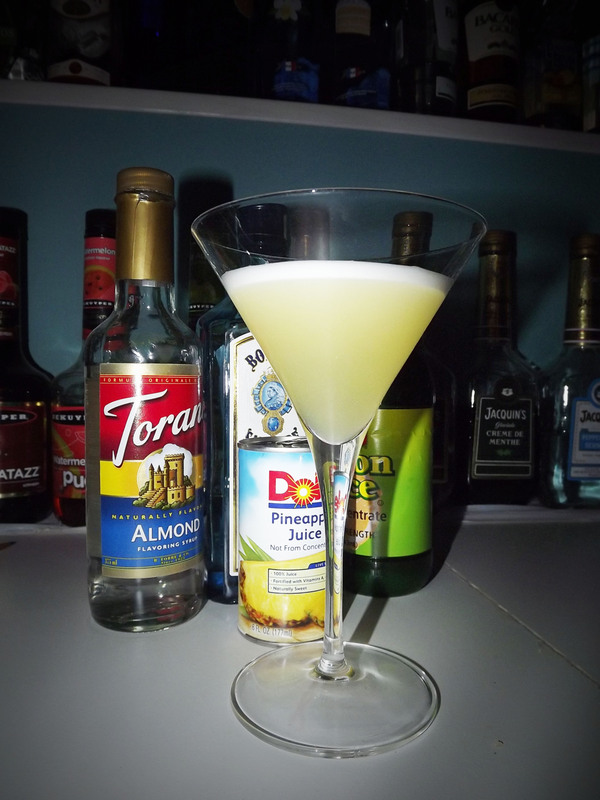 It’s use of the almond syrup makes for a unique combo, but I don’t know how well it works together with the tropical flavors of the drink. It is though very much a tiki style drink (which aren’t really my favorite). If you are into tiki drinks this one might be a good one for you to try. Also note that the original recipe calls for Orgeat Syrup (which is essentially orange blossom water with almond syrup). In most cases though Almond and Orgeat are interchangeable. Do you live dangerously? Well you might want to start, by downing this powerful cocktail. 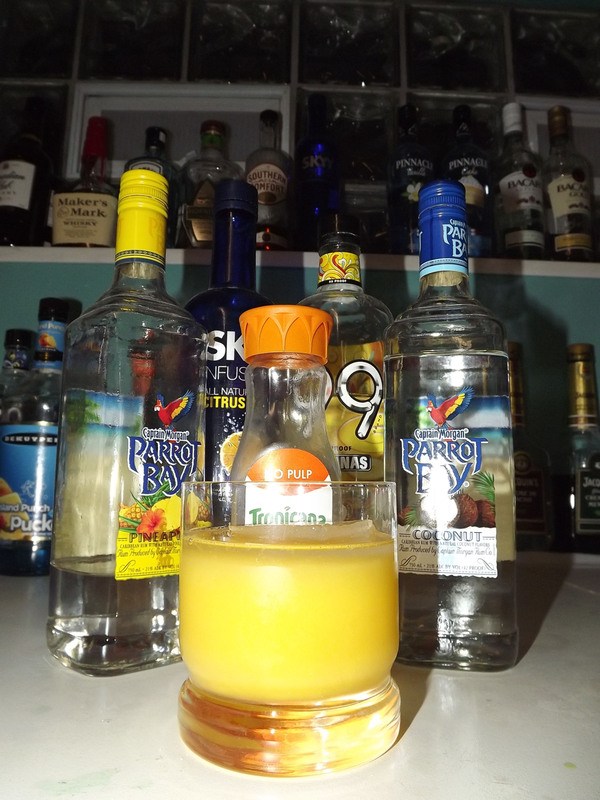 The American Graffiti is a summery tropical drink with a lot of flavor without a harsh punch (taste wise). The main aroma builds from pineapple and sweet/sour and its bright red color is reminiscent of the Red Demon cocktail. 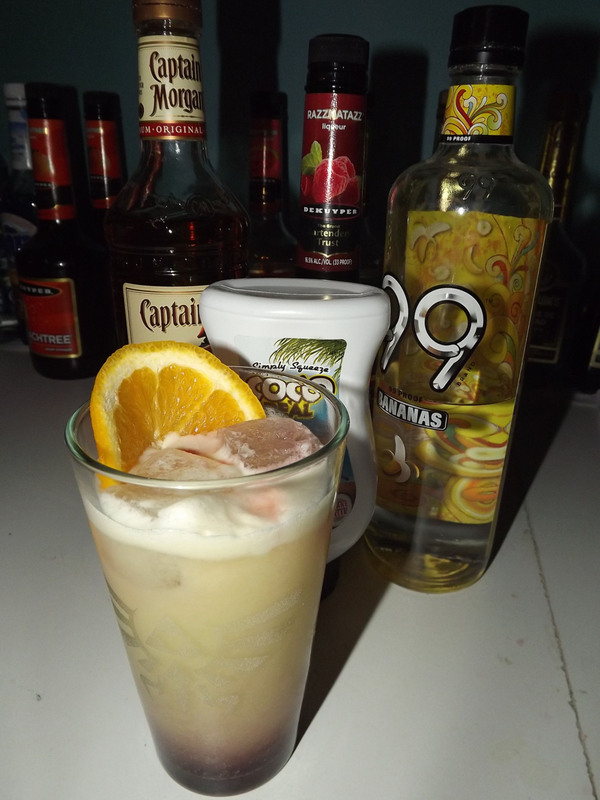 The drink starts off very smooth and then hits the back of your palette with a mild and full bodied rum. Considering the amount of alcohol present, I am surprised it doesn’t have more of a harsh kick. I imagine this is thanks to the mix of sloe gin and roses lime to build a fruity citrus into the mix. My only concern with the original recipie is that it calls for both “light rum” and “rum.” Because the first rum is specifically light, but the second is unspecified, I decided Bacardi Gold would be a nice balanced choice. I do wonder how Some Captain Original Spiced would change this drink. Even a flavored rum would be a good choice (something like mango or coconut). Either way though it’s a very solid drink with a great open end for variations. Make it again? Yes. Try flavor variations too! Shake and strain all ingredients into an iced tumbler. Garnish with an Orange slice and a Cherry. Is the name a little cheesy? Yes, but don’t blame me this time (it’s not an original). 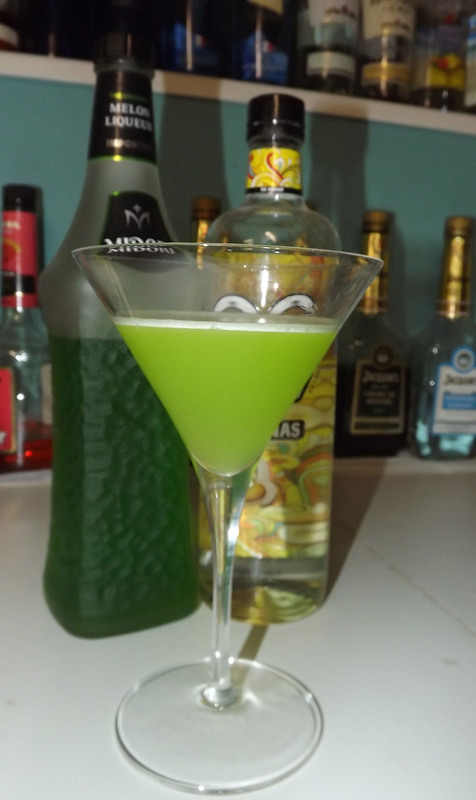 The Midorable is a radiant green cocktail with a slight foam on top so it doesn’t require a garnish. It has a mild melon aroma which is very inviting. The flavor begins with a little banana, moves it’s way to the melon, and the finishes just a little sour. A sweeter variation might be worth a try (replace lime juice with simple syrup). Rolling in pretty late this evening for a new Medium of Mixology Original Cocktail. The tropical driver was designed to be the embodiment of a tropical island vacation. Sweet and powerful, if the optional 99 Bananas is used as a float it creates a strong aromatic blast before it ever hits your tongue. The flavors melt together in a pure mix of orange, banana, pineapple, with a slight hint of coconut. Straight Build in an iced tumbler.